For Shand, owner of the Shenval Press, this was the fourth ambitious visual arts magazine he had started. In collaboration with the editor Robert Harling, Shand (1905-67) had published the influential journals Typography (1936-9), Alphabet and Image (1946-8) and Image (1949-52). McLean (1917-2006) had contributed an article about the history of the Egyptian letterform to the first issue of Alphabet and Image, and he recalled that it was Harling who mentioned him to Shand as a possible editor for Motif. Shand proposed to pay the salaries of both McLean and his assistant, Fianach Lawry (then Jardine), and gave them a room in Shenval’s Georgian offices at 58 Frith Street in Soho, London. “Ruari was very much an all-up-front person, certainly highly intelligent and literate, but I don’t think there were any mysteries, whereas Shand was a much more complicated person,” says James Mosley, who contributed to Motif from the first issue. The first edition of Motif, published in November 1958, established the template for the following eight issues. Unusually for a magazine, Motif had a hard cover, like a book; the binding was filled, front and back, with a hazily idyllic domestic scene, showing women at a table, drawn direct to silkscreen by Charles Mozley, who had also come up with Motif’s name one evening. In subsequent issues, the endpapers were used for graphic art. The contents included the first installment of a three-part history of photography by Helmut Gernsheim; a piece titled “The Born Illustrator” by Edward Ardizzone; a portfolio of drawings and sculptures by Elisabeth Frink, with an introduction by poet and novelist Laurie Lee; a wry guide to art students by Richard Guyatt, professor of graphic design at the Royal College of Art; and an article about the type foundry of Vincent Figgins, from 1792-1836, by James Mosley, recently promoted from assistant librarian to librarian of the St Bride Library. This distinctive publication made an immediate impression. “The first issue of Motif is a tribute to the British graphic arts industry and equals anything that can be produced abroad. The contents are agreeable, readable and have civilized charm,” wrote James Moran in Printing News. Motif drew attention in the general press, too. “As a vehicle for ideas, it may well become extremely valuable,” wrote artist and art critic Quentin Bell in The Listener. Motif rapidly established a circle of enthusiastic contributors. A sense of how McLean and Shand operated can be gained from the entertainment expenses for 1960 to 1962 held in the Motif archive at the University of Reading. “Lots of people had these amazing lunches in those days,” says Mosley, who describes McLean as a bon viveur who enjoyed the good life. Mosley was the magazine’s guest on four occasions in less than a year. Other names that appear in the expenses include Berthold Wolpe, Paul Rand, David Gentleman and Richard Hamilton, and regular contributors such as type historian Nicolete Gray, architectural critic Reyner Banham, Maurice de Sausmarez, head of fine art at Hornsey School of Art, and London art critic Robert Melville. It was an eclectic mix of artists, art teachers, critics and scholars, whose interests might have been expected to appeal to quite different kinds of reader (it also seems doubtful that laundrymen were ever a significant part of the readership). Mosley suggests that the art subjects were “slightly weird in a journal which was on the face of it typographic.” He didn’t read these pieces and believes that Motif’s typographic subject matter was the central issue for McLean. The emphasis on art, Mosley suggests, must have come from Shand, who collected paintings by the likes of Eric Ravilious and Edward Bawden. Allen Hutt writes that Motif was “beyond doubt an art publication” and that its value would lie in its presentation of the work of emerging artists. An analysis of the contents certainly bears this out. Not including reviews, Motif published 37 articles on type and lettering subjects; 40 on the graphic arts (illustration, drawing, wood-engraving and print-making); and 53 on painting, sculpture, photography and art education. It is worth noting, too, that Motif’s covers — the viewer’s first impression of its contents and concerns — invariably place the emphasis on painting and graphic art, making them quite different from the typographical covers of Typography and Alphabet and Image. In issue 3, a series of decorative drawings of shop fronts by John Griffiths possess a vibrancy of hue and a passion for eccentric descriptive detail, recorded with effortless delicacy and charm, rarely seen in illustration today. In 1960, on a trip to the US to attend the annual design conference in Aspen and promote Motif, McLean visited Milton Glaser, whose work he knew from the Push Pin Graphic. McLean suggested that Glaser contribute some drawings and Glaser, who had been looking at Picasso’s animal pictures, proposed a bestiary. The presentation of the 12 images in Motif no. 7 (summer 1961) forms the most elaborate printed item to appear in the magazine. The folding pages open to reveal a display six pages wide that includes drawings of a lion, a grasshopper, a cassowary, a frog that appears almost to be clad in camouflage, and a mischievous, red-faced mandrill. “It was most informal, as things in those days tended to be before marketing people controlled everything,” recalls Glaser. “I did the drawings, he liked them and published them, and that was the end of it.” It wasn’t quite the end of it: some of them were published in 1965 as a children’s book, Cats and Bats and Things with Wings, with poems written in response to the images by Conrad Aiken. Costley, who was asked by McLean to design at least one of the articles (in issue 9), takes a different view, seeing Motif’s visual variety as fundamental to its appeal. “Each article stands on its own,” he says. “There’s a sort of scrapbook feel to it. The articles are so different in content that they respond to different treatments. It would be interesting as an exercise to take an issue and knock it into a conforming grid.” I think this is right. The variety suits the range of material and Motif would be flatter and considerably less engaging handled in any other way. It has a warmth of tone and a readability that Typographica lacks. On the other hand, its typographic disunity does date it. It feels like the product of the gentlemanly world of the 1950s bibliophile and, as the 1960s got under way, and the gaps between issues began to lengthen, it had the air of a publication being left behind by the mood of the times. The flexibility had some other advantages. Mosley’s article “English Vernacular: A Study in Traditional Letter Forms” in Motif no. 11 (winter 1963/4) — the fruit of two years of obsessive research — runs to around 14,000 words and 106 illustrations over 53 pages. The only way to accommodate all this and to have the images move in parallel with the text was to use a three-column grid. There is evidence in the Motif archive that Mosley himself specified the text setting: 9pt Scotch Roman, 1pt leaded, on a 15 em column. The type’s appearance here is denser than usual, but for the most part, despite the lack of visual unity, Motif’s pages were highly inviting and readable. For the 10th issue in winter 1962, Motif shed its stylish cover boards, which had always been prone to damage in the post and to warping. Pop Art covers by Peter Blake and Eduardo Paolozzi suggested that the magazine was making a not entirely convincing attempt to embrace the art scene’s new preoccupations. From this point, the print specification was less elaborate than it had been in Motif’s early 1960s heyday. Motif’s use of special papers and its fine screen work had always imposed demands on Shenval, taking up time and attention to print and bind. “Motif had to wait its turn down at the printing works,” says Lawry, “and that could be maddening.” There were lengthening gaps between its appearance, and the issue with Mosley’s article was much delayed. Shand seemed to lose interest and contributors went unpaid. “It is clear that we cannot continue to produce Motif with the present irregularity of appearance,” writes McLean in a note to Shand in December 1964. “I am not prepared to give it up without a struggle to save it. There is still no magazine in Britain catering for all the visual arts in visual terms.” It was a disheartening time for McLean. Shand was absent for long periods and hard to pin down when he surfaced. It emerged that he was ill, and he died suddenly in November 1967 of a coronary thrombosis. The final issue, no. 13, originally planned for publication in early 1965, came out at the end of 1967 as a tribute. It had been three years since the previous issue in winter 1964. “There was a time,” notes Glaser, “when idiosyncratic publications like this that were the vision of individuals could find a way to survive. It’s just charming to see how entertaining, instructive and interesting they were able to be. Anybody who read Motif back in the 1960s would remember it.” Four decades later, the magazine’s carefully balanced coverage of art and design still looks intelligent and challenging. No magazine published in Britain today attempts such a broad, well-informed and even scholarly survey of the visual arts, and this might lead us to wonder whether the “receptive whole man” (or woman) with wide-ranging visual interests that Motif imagined as its ideal reader exists in any great numbers, even now. Art and design are still, for the most part, discussed separately in specialist publications aimed at narrowly defined readerships. Motif stands as a vivid reminder of a refined and now fading publishing culture dedicated to high standards of inquiry and writing, and with a passion to explore the aesthetic possibilities of printing and the boundless pleasures of the visible world. This is an expanded version of an article first published in Eye no. 62 vol. 16, Winter 2006. It includes additional research undertaken for a lecture at the St Bride Library in May 2007. This is its first publication online. All photographs courtesy of Eye, except where indicated. A moving tribute in the evocative mode, concerning a most fitting subject. Motif continues to inspire. I consider myself fortunate in having the thirteen issues here beside me. 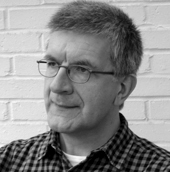 John Griffiths, the illustrator of “A Front of Shops: Some Decorative Drawings” (above), died in March 2012. The Guardian has a good obituary and a slideshow. More drawings from “A Front of Shops” (with a bit of camera distortion) can be seen at Quad Royal. Wonderful to see these in colour. A request if I may. Does anyone have a colour scan of the John Parry watercolour on pp.72-73 of Motif 6 or know where to get one? Thank you. I can't find that image anywhere online. It's a shame that Motif no. 6 doesn't indicate the collection it came from. 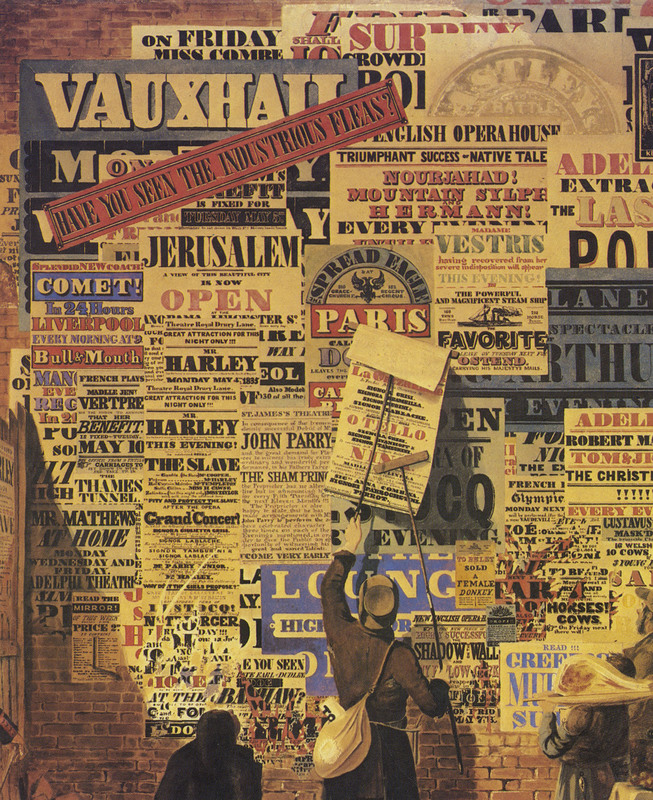 In the first issue, the magazine showed the similar and better-known painting of street posters and playbills by John Orlando Parry titled "A London Street Scene" (1835 — varied dates are given but that's what it says on the painting). Would that suit your purpose? It's available in several places online and Feuilleton has a great large scan of a detail. There's also a huge scan from a book here.